I haven’t been to many Johnnie Walker events before so when the invite came through to enjoy the launch of the Johnnie Walker Blue Label City Edition I jumped at the chance. Then I read that it would take place on the London Eye which sounded simply brilliant so replied within nanoseconds with a resounding ‘YES!’. Well, I was a bit more professional and eloquent than that but you get the drift. Arriving to the ‘priority queue’ area was hardly as glamorous as you’d expect from the oft-overused ‘priority’ word in experiential marketing but upon seeing the industry legend that is Colin Dunn all antes were upped. Attendees mingled for a bit then excitedly hurried to board the private pod within the minute window we were given – I suspect we had longer considering this was a high budget Diageo launch but nonetheless we all complied and got involved. 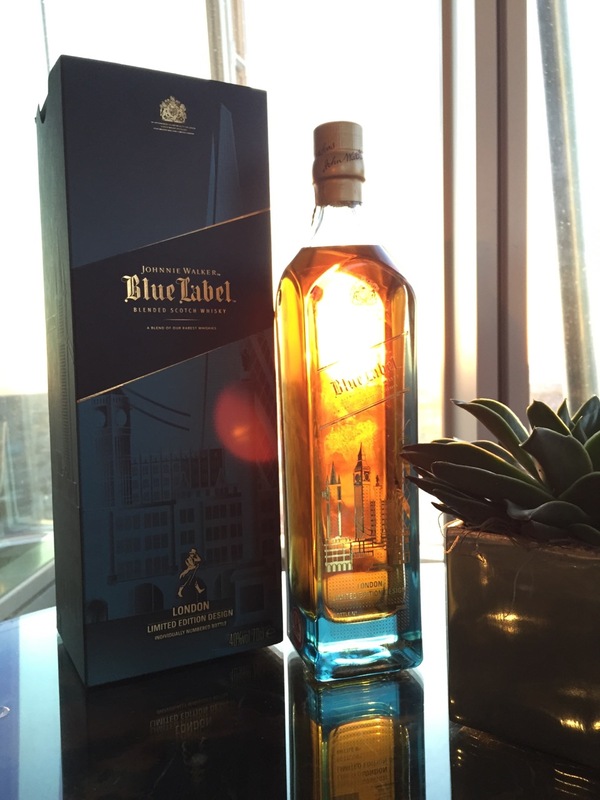 After a few minutes of taking in what was about to happen we were handed our first dram of Johnnie Walker Blue Label whilst we admired the gorgeous new bottle, and it really is a lovely bottle design with iconic London landmarks screen printed on in typical Johnnie Walker Blue Label gold. Then we got to try it. Now, this was not my first time drinking Johnnie Walker Blue Label but it is the first time I have been fortunate enough to be guided through a tasting of this super premium liquid. Colin forced us to hold the liquid in our mouths for 60 seconds with our eyes shut, which feels like a helluva long time when you’re excited about enjoying an incredible whisky with an incredible view. Johnnie Walker Blue Label has a mellow, rounded nose, with a dry smokiness (a Johnnie Walker signature flavour) mixing with raisin sweetness. It is best savoured with the palate cleansed and cooled by iced water. One sip reveals a velvety mouth-feel, then an explosion of flavour. At once you’ll discover hazelnuts, honey, rose petals, sherry and oranges. Subsequent sips reward you with more hidden secrets like kumquats, wispy aromatic smoke, sandalwood, tobacco, and dark chocolate. After two rotations we headed for cars and off to the Gong bar at the Shangri-La Hotel at The Shard to sample newly-created cocktails to mark the occasion of this launch. One of the best mixologists in the world, Christian Maspes who also happens to be the head bartender at Gong created an incredible signature serve called Eagle Eye in honour of the London skyline we could all see last night as well as its presence on the Johnnie Walker Blue Label City Edition bottle. You’ll have to go to Gong to try this as it really was something special and created from some impressive ingredients including white strawberries, three types of vinegar, a black peppercorn shrub and of course, Johnnie Walker Blue. The rest of the evening was simply to sit back, enjoy the view and the company of those privileged enough to also be in attendance. I must say the view from the Shangri-La Hotel at The Shard is truly majestic, what a perfect night for it. Many thanks to Johnnie Walker and Diageo for the invite, this one will live long in the memory.